Finding the right kind of grass can be difficult with Australia’s climate. We want turf that is soft and comfortable while able to withstand tougher wear. Luckily, there is a large variety of turf available which looks great and can flourish during our relentless summers. The best turfs for summer are the ones able to stay alive and remain green for the longest period of time. They need to withstand water restrictions, heavy exposure to the sun, or even receiving no water at all. Below we look at the four best turfs for withstanding such conditions. Conquest Couch is low-maintenance and flourishes in the sun, making it one of the best summer turf options. It is semi-dwarf, with a medium texture and bright mid green colour. It is highly durable and has a dense root system which allows it to recover quickly when damaged. Even if the lawn dies from heat and lack of water, it will recover relatively easily once water becomes abundant again. Unlike other summer lawns, which perform poorly in winter, Conquest Couch will hold a great colour throughout the year as long as it’s properly fertilised. If you live closer to the coast, Empire Zoysia turf is the ideal summer lawn option. It is incredibly adaptable, tolerating sloping landscapes and performing well in sandy and clay based soil. It is low maintenance and strong, making it a perfect choice for high-use areas that get a lot of sun exposure. Like Couch grasses, the Empire Zoysia has deep root systems that allow it to recover after brutal drought conditions. 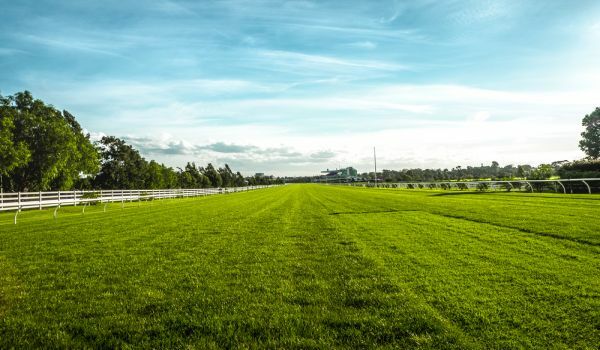 Soft to the touch with a beautiful dark green colour, Empire Zoysia is a fantastic, versatile turf for Australian summers. Soft-leaf varieties of Buffalo grass are an excellent summer choice for Australian lawns. Buffalo grass maintains great colour all year round and has a high wear tolerance and good drought tolerance. Palmetto Buffalo grass is particularly popular for its outstanding emerald green colour and very soft leaf. Palmetto Buffalo grass is very low maintenance. One of the reasons why it is so popular in Australia is its slow growth, requiring far less mowing. A deep root system allows it to use water efficiently and stay green for longer in dry conditions. Kikuyu is a proven performer in most Australian climates and it is widely used for commercial, sporting and broad-acre areas. It’s a vigorous grower that can tolerate summer weather from Darwin to Melbourne. If you want a lawn that is easy to grow that can tolerate heavy wear and traffic, this is the lawn for you. One thing to keep in mind is that Kikuyu lawn grows so quickly that it has to be mowed once a week during summer. It’s not commonly used for residential areas as it can invade gardens and is susceptible to weeds. Each lawn ultimately has its own unique benefits and downfalls. The ideal summer lawn for you will depend on your soil, climate and intended usage. If you would like more advice or guidance on picking the right turf for you, feel free to contact our team. Check out our lawn range or call us on 1800 887 253 for a chat.